FACES are black, constant whistling blasts the eardrums, the seat is bounding up and down to the tune of a million jolts, and the world is a hammering, hissing, vibrating cauldron of sound, steam and smoke. Sounds like hell? Let me tell you. This is my idea of heaven. 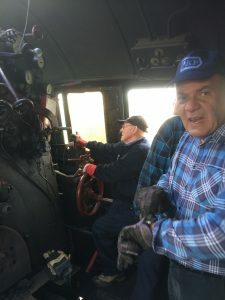 It’s a privilege to be one of a pair of visiting Britons on the footplate of the Blues Express, an annual steam train jolly taking pop fans from the Polish city of Poznan to the local equivalent of Glastonbury at the lakeside town of Zakrzewo. The tradition is to use a heritage locomotive for the journey. In previous years it’s been Beautiful Helena. This year Old Smokey. The jazzmen are getting in the groove as we do our bit with coal shovel and steam regulator. They are excited and so are we. For me, a dream come true. Nothing compares to the feeling of scale, of the size and weight of this 100-ton monster. The fans are making it a special day. As the train draws into each principal station there are wild cheers from the crowd, a band strikes up and things are hopping on the platform. Then comes a long queue of visitors climbing up the steep steps to peek at the controls and the roaring furnace. From grandmas to jiving girls. From little boys to tiny girls. We even have a five-year-old pink fairy. Somehow, the footplate chief performs a minor miracle, locating what must be the only clean white cloth in his domain to wipe the soot and grime off her hands. Then she’s handed back down to Mother. When each station concert is done, wild whistling heralds the moment to climb off the engine – front, sides and back – and troop into the smart blue carriages. Until the next stop. The towns come and go: Rogozno, Chodziez, Dziembowko and Pila. And there we have a problem. The steamer is a thirsty beast. We fill her up at Poznan from an old water tower but at Pila all the steam facilities have been dismantled. Up step the local fire brigade, with smart black uniforms, shiny red fire engines and long white hoses. And again at Lipka. It takes three appliances to fill our greedy old lady after we’ve given her a twirl on the turntable. Ditto on the return. We Brits operate in pairs – Rob Flynn from Leeds and myself – and begin our trip at Wolsztyn, a steam depot town lined with the hulks of dozens of old steam locos from the past. Our introduction to 0149-59, a 2-6-2 passenger express locomotive, starts at 8 o’clock, an hour before departure. We’re handed a bucket of oil and some mammoth cloths and told to climb up and clean the beast while the Polish crew get on with furious riddling, raking and rebuilding the fire. Then the engine runs light to Poznan where we couple up to the train. For the train nuts among us, here’s the starting drill: at right-of-way, a long loud whistle (none of your little toots), open the regulator but not too far; wait several seemingly agonizing seconds before there’s a sign of movement, then pull back to prevent wheel spin. Then, keeping an eye on the steam dial and not letting it rise beyond the five marker (running light) or eight (with train), gradually open her up. When she’s chuffing nicely flick off the locking catch and wind the big red wheel. This is the cut-off gear which controls the amount of steam entering the cylinders. It’s connected to lots of heavy metal so those not used to hurling javelins or tossing the caber will need to stand up to heave on it. Reduce from a starting position of 60 per cent to 50, then 40 and finally to a cruising 30. So, wipe the sweat from your eyes with a blackened glove, you’ve actually got her going. Now she’s bouncing along, rattling away, spewing smoke and sparks, eating up the vast open spaces of Poland with its enormous vistas of corn and forest, whistling over hundreds of level crossings, flashing through stations with names you can’t read let alone pronounce, beating up the kilometres…but can you stop her? 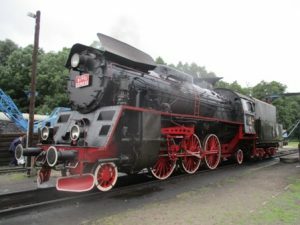 The trip was organised by the Wolsztyn Experience, who also do short footplate runs from the Polish town of that name. 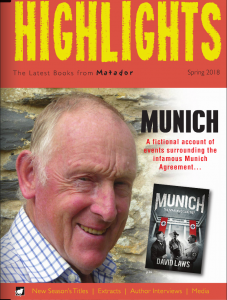 See web site or UK contact Nigel Fitt 01842 860436.